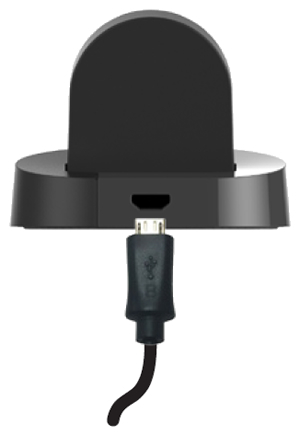 Connect the charging cradle to a power source using the supplied AC adapter and USB cable. With the left edge facing down (power button facing up), place the watch on the charging cradle as shown. Ensure the left edge of the watch is properly seated into the cutout. A blinking white LED (bottom edge of the cradle) indicates that the watch is charging. A solid white LED indicates that the watch is fully charged.